Bank account in India for NRIs/PIOs are regulated by RBI rules. This is almost mandatory for NRIs to have one to manage their money in India and sending money form outside India. These accounts are subject to Indian Banking Regulation Act and FEMA. Deposits in these accounts can be kept in any of the currencies of the basket or INR, and carry special rates of interests different from domestic rates on deposits. The accounts can broadly be operated as normal bank account but of course subject to Indian Banking Regulation Act and FEMA. The conversion of currency into INR attracts the normal rates of conversion offered by the respective banks to its customers, with rider of some marginal good rates to the customers having good banking relations. Deutsche Bank in India provide BANKING SERVICES for the Non Resident Indians (NRI) or Person of Indian Region (PIO) to make their banking easy. These services are available only for the Resident Indians, Non Resident Indians in Germany, and Non Resident Indians in any part of the world planning to move in Germany for work purpose or job seeking purpose. Highest NRI and NRO Deposit rates. 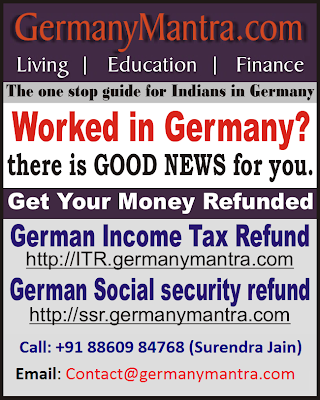 To avail this service, send an email to contact (at) GermanyMantra.com with Subject Line, NRI Banking. Don't forget to write your full name and contact number. Who is Non Resident Indian ? A Non-Resident Indian (NRI) is a citizen of India who holds an Indian passport and has temporarily emigrated to another country for six months or more for work, residence or any other purpose. A person of Indian origin (PIO) is a person of Indian origin or ancestry and some other countries who was or whose ancestors were born in India but is not a citizen of India and is the citizen of another country. A PIO might have been a citizen of India and subsequently taken the citizenship of another country. Non-Resident Indian is often faced with the situation of maintaining a Rupee account in India. Primarily there are two reasons for opening such account: NRI wants to repatriate overseas earned money back to India and/or NRI wants to keep India based earnings in India. NRI has the option of opening a Non Resident Rupee (NRE) account and/or a Non Resident Ordinary Rupee (NRO) account. An NRO account can also be opened by a Person of Indian Origin (PIO) and an Overseas citizen of India (OCI). What is Difference between NRE and NRO Account ? Repatriation: NRE account is freely repatriable (Principal and interest earned) while the NRO account has restricted repatriability i.e permitted remittance allowed from NRO is up to USD 1 million net of applicable taxes in a financial year after giving undertaking along with a certificate from a chartered accountant. Tax Treatment: NRE account is Tax free (no Income tax, wealth tax and gift tax) in India. On the other hand the interest earned in NRO account and credit balances are subject to respective income tax bracket and are also subject to applicable wealth and gift tax. Deposit of Rupee funds generated in India: If an NRI/PIO/OCI is earning income originating in India (such as salary, rent, dividends etc.) he/she is only allowed to deposit it in NRO account. Deposit of such earnings is not permitted in NRE account. 4. Joint Holding: NRE account can be iointly held with another NRI but not with resident Indian. On the other hand NRO account can be held with NRI as well as resident Indian (close relative) as defined under Section 6 of the Companies Act 1956. Joint Holding: NRE account can be iointly held with another NRI but not with resident Indian. On the other hand NRO account can be held with NRI as well as resident Indian (close relative) as defined under Section 6 of the Companies Act 1956. Following is a list of few banks offering NRI Banking services. Most of the banks provide these services. Disclaimer: GermanyMantra does not take any responsibilities about the product, services, quality provided by these banks.